This one of my favorite things to eat in the morning. It’s quick and easy to make. It’s tasty and it’s filling, and best of all, it’s portable for those mornings when you may need to take out the door with you! This recipe may seem like such a simple thing, and in all honesty, it is. But at LJB, we have come up with a few little extra touches that make these the “BEST”. Using half & half instead of milk adds a depth and flavor. Adding a little grated cheese at the end adds texture and flavor. And cooking up your own fresh tortilla (we always have these on hand) just makes it delicious! See if you don’t think so too! In small bowl, crack eggs then add half & half and salt and pepper, and scramble until completely combined. Set aside. In medium non-stick skillet over medium heat, cook raw tortilla about 1-2 minutes on each side or until light brown “cooked” spots appear. Remove from pan and set on breakfast plate. In same skillet, add the pat of butter and let melt. Add egg mixture and scrap along bottom every couple of minutes until eggs start to set. When almost cooked, add the cheese. Allow cheese to melt while still tossing and scraping eggs. 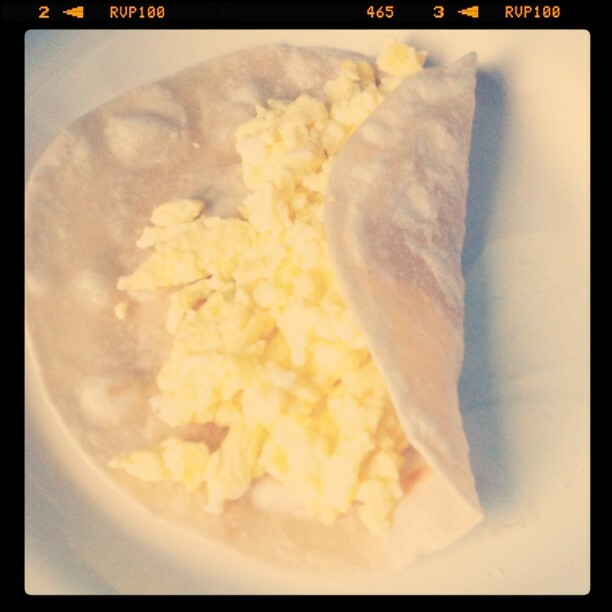 Once eggs are set, remove from pan and place on tortilla. Roll up and enjoy! We like these just as they are… plain and delicious, with no doctoring, but if you prefer you can top this dish with salsa, sour cream, tomatoes and/or avocado. Obviously, this recipe can be doubled, tripled, etc for how ever many people you need to feed. If you do this, upgrade the skillet size to large; cook all the tortillas first, and cook all the eggs together afterwards.